Kitchen renovations are the home project most often taken on, yielding incredible value with a great return on investment. Indeed, kitchen renovations are one of the smartest investments you will make when it comes to your home. If you have decided that a kitchen renovation is in your future, you need to figure out how to finance the project. Today, we have more options than ever before to finance a renovation. That said, some options have advantages over others. 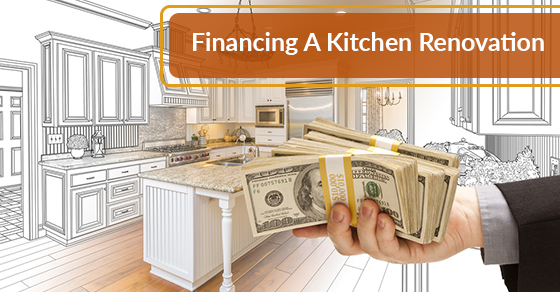 Here is a look at the three best ways to finance a kitchen renovation. One of the best ways to finance a kitchen renovation is via your mortgage, which is generally the option that will secure you the lowest financing costs. This is particularly ideal if you can port the mortgage when you sell your home, but even if the mortgage has to be broken and the new mortgages are variable-rate mortgages, this is still one of the best options. Variable-rate mortgages only have a three-month penalty, but their low interest makes up for this penalty. If you already have a home equity line of credit arrangement in place, this is typically just as good of a financing option as increasing your mortgage, and it is one of the least expensive ways to borrow. Another benefit of a home equity line of credit is that it won’t result in any penalties. Today it is actually common practice for many banks to offer a home equity line of credit upon renewing your mortgage, which means that you may already have this arrangement in place. If so, this is certainly your best course of action. If you don’t already have this arrangement in place, keep in mind that there are additional upfront costs involved in this process, such as a home appraisal fee and legal fees. A personal line of credit, as detailed below, may be a better fit for you. The benefit of a personal line of credit is that it doesn’t have the additional fees that a home equity line of credit does, making it potentially the better option for those without such an arrangement already in place. In general, if your loan is going to be less than $15,000 and you plan to pay it off in two or three years time, a personal line of credit is another great option that you have available. Alternatively, you might want to opt for a fixed-rate loan if you foresee taking longer to pay it off. Brothers Plumbing is the leading choice for kitchen renovation services in Toronto, offering beautiful results and affordable rates. Contact our team of experts today.